Lacquer Lockdown: New Year's Nail Art! 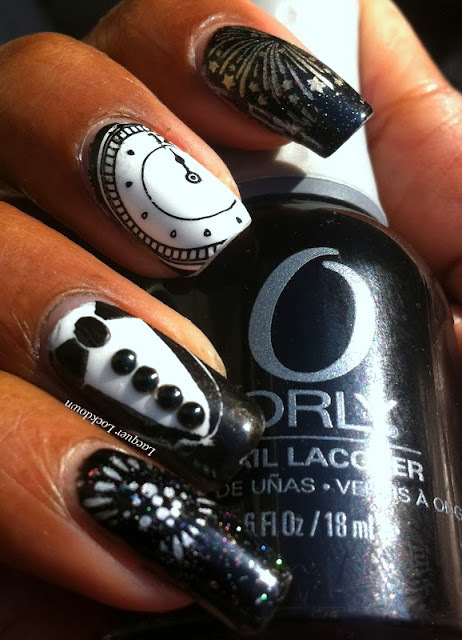 I wanted to do a tuxedo suit style nail art for dog years now! I have no idea why I waited this long. I will tell you though this was the trickiest image to stamp. I tried over 4 times before I could get the placement and the complete image dead center the way I wanted with the coverage I wanted. What a mess! I'm still not entirely pleased with how that nail in particular turned out but practice makes perfect. I added some black studs to the tuxedo to create a little 3D effect that I found fairly cute. I love this plate and have to say this is another winner MoYou! Right now I can say without a shred of embarrassment I have 36 plates on my wishlist just hanging out for the opportune moment to strike. Ok maybe I'm a little embarrassed, but you guys haven't even seen my MoYou stash have you? It's massive lolol. In any case I have lots more nail art around the bend and of course another Plates I Love feature soon, as well as an awesome review of 2 new plates from the genius plate maker herself little miss Bunny Nails. Thanks for reading and see you next post!